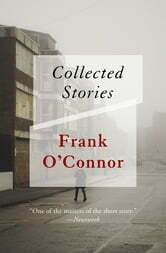 The definitive collection from an Irish literary icon, “one of the masters of the short story” (Newsweek). Dublin schoolteacher Ned Keating waves good-bye to a charming girl and to any thoughts of returning to his village home in the lyrical and melancholy “Uprooted.” A boy on an important mission is waylaid by a green-eyed temptress and seeks forgiveness in his mother’s loving arms in “The Man of the House,” a tale that draws on O’Connor’s own difficult childhood. A series of awkward encounters and humorous misunderstandings perfectly encapsulates the complicated legacy of Irish immigration in “Ghosts,” the bittersweet account of an American family’s pilgrimage to the land of their forefathers. In these and dozens of other stories, O’Connor accomplishes the miraculous, laying bare entire lives and histories in the space of a few pages. As a writer, critic, and teacher, O’Connor elevated the short story to astonishing new heights. This career-spanning anthology, epic in scope yet brimming with small moments and intimate details, is a true pleasure to read from first page to last.